I have a soft spot for the Calypso jr. design. Back when I was noob collector, my mantra was “if it’s expensive it must be better”. And indeed the more expensive the knives got, the better they usually were. The epitome of the folding knife to me for a long time was the Sebenza. The sharpness and slicing power of the knife was amazing. Then I got a Military and discovered that a good knife can be had for fewer bucks. The Military also had way better ergonomics for me but that’s a different discussion. However, my main cutting needs are for smaller chores for which I prefer to use my left hand. I got an FRN Calypso jr for that role. I figured it looked a lot like the Military so it had to be good. I was right and though I prefer tip-up carry now, I’m always interested to see the next Caly jr. incarnation. The Mini Manix is my favorite carry folder right now; apart from its functional qualities it’s just a plain ‘cool’ piece of cutlery. It is a bit bulky sometimes. So that aspect, combined with my long love affair with the Calypso design, caused me to pull the trigger on the Caly III. The Caly III is basically a UKPK with a lock. The UKPK started as an initiative on the British Blades forums, and it was long thought to be a sprint run of sorts. 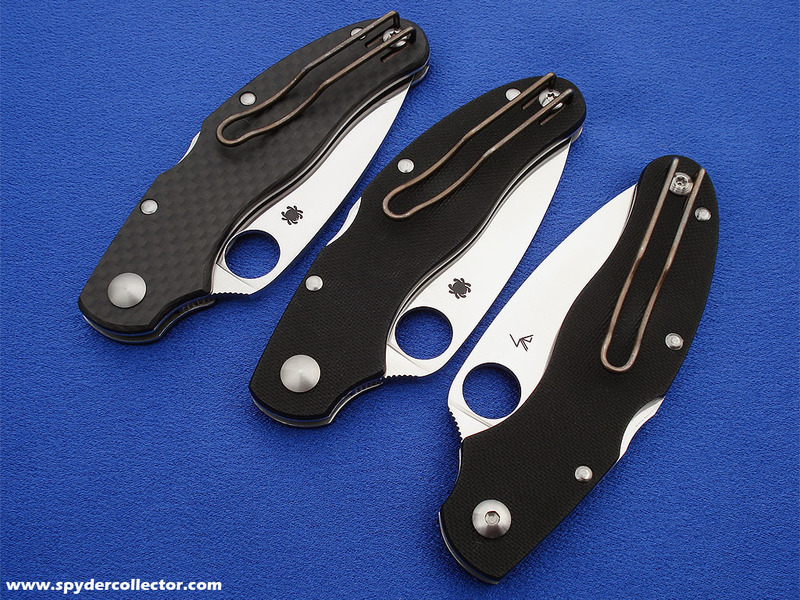 However, it was so well received that Spyderco not only included the UKPK as a regular production offering, it also added a version with a lock, i.e. the Caly III. The Calypso jr. pattern is pretty much considered as the ‘challenge coin’ for true knife afi’s. Even on many non-spyderco forums, the Calypso jr. is highly regarded as THE modern pocket knife. Its size is just right for unobtrusive pocket carry (with or without clip), the flowing lines offer a comfortable grip and that thin flat ground blade is as sharp as the proverbial scalpel. The Caly III differs from the original (FRN) Calypso jr. on a few aspects. The handle on the Caly III is bit slimmer and longer. It feels different; I dislike the slimmer handle but the increased length is nice. The Caly III doesn’t fill the hand as nicely as the Calypso jr. On the plus side, the new Caly III is made with G10 handle slabs! The G10’s surface definitely helps to keep a good grip. The surface of this Japanese made Caly III is less rough than the G10 Golden models with their notorious out-of-the-box sandpaper surfaces. So far, with a few weeks of pocket carry, the Caly IIIs G10 has remained nicely grippy. The worn in Caly III G10 is a little less aggressive than the excellent worn in Golden G10 handles. The UKPK uses S30V for the blade, but because the Caly III is made by the Japanese makers for Spyderco, it has a blade made from VG-10. That’s no problem for me. As I noted in my ZDP Jess Horn review, VG-10 is my favorite blade steel. I’m happy to note that the Caly III upholds the Calypso jr’s reputation of laser-scalpel-sharpness. Furthermore, the cusp on the blade of the Caly III is rounded off and the ramp has a small strip of fine jimping for extra purchase in use. The sharper cusp of the Calypso jr. never posed any practical objection, as it never pinched my leg during carry or my hand in use, but it’s always nice to see sharp edges (non-cutting edges that is) removed. The action on the Caly III is really smooth! The pivot adjustments were spot on, on both my knives (PE & SE). The blade travels in and out of the handle, as if it’s rolling on glass. I’m not sure if the infamous phosphor bronze washers are used on the Caly III. The action also remained smooth after I washed and oiled the knives a few times. As much as I like wire clips, I’m a bit disappointed to see the UKPK’s clip on the Caly III. This type of fold-over wire clip is intended for discreet carry. It works wonderfully, as intended, but at the cost of ‘retrievability’ and ‘travel in the clip’. For me, the Caly III is buried a bit too deep in the waistband or pocket. I inevitably grip the clip itself to draw the knife, thus increasing tension on the clip and making it a bit tougher to draw from a pocket. Another aspect is the side-to-side travel in this type of fold-over wire clip. At first I thought that I didn’t fasten the clip tightly enough, but it is inherent in this particular version of the wire clip. You will have some side-to-side travel in the clip of the Caly III, no matter how hard you try. It is a cosmetic concern, as my carry and use in the past few weeks haven’t caused the clip to loosen and the knife didn’t fall out of my pocket. It stayed put just as well as other clips. The Caly III is actually a nice alternative to the Mini Manix. For regular chores, you don’t really need the tough lock or bulky design that the Mini Manix has. And if someone were to ask me for the best ‘pocket knife’ today, then I’d either suggest the Delica 4 (for novices) or the Caly III (for people who know a bit about knives). The size and ‘feel’ is just right for all tasks you can expect from a pocket knife. The clip can stand to be changed to a Dodo or Poliwog type wire clip, in my opinion. Still, that doesn’t take away from the fact that the Caly III is a really refined piece. Every little, curve, nook and cranny on that knife is in just the right place. 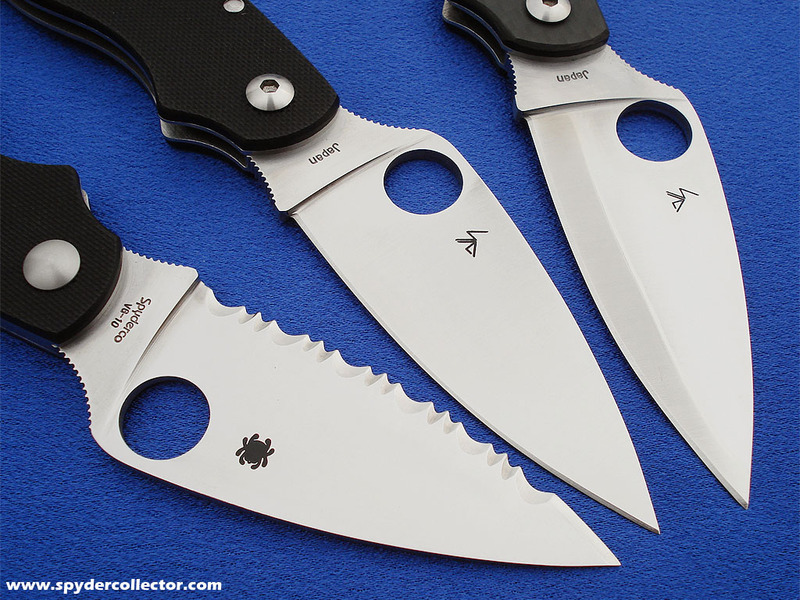 I still prefer the Mini Manix, mainly because of the ‘cool’ factor, but I wouldn’t feel ‘under knifed’ with my pair of Caly IIIs. The Caly III has a steady place in my carry rotation, and they’re back-ups to my Mini Manixes. When I feel like traveling lighter, but still carry a serious non-FRN knife, the Caly III is the one I’d reach for. This entry was posted on Monday, April 9th, 2007 at 7:43 pm and is filed under Carry Folders. You can follow any responses to this entry through the RSS 2.0 feed. You can leave a response, or trackback from your own site. Greetings from Romania,the land of Dialex Junior. 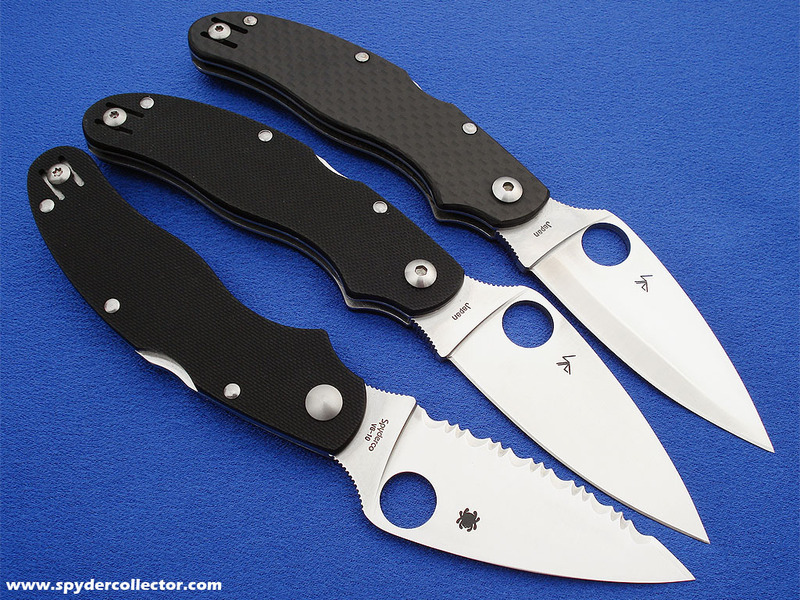 Great Reviews.I myself am a huge fan of Spyderco. Caly3 in VG10 and Caly Jr.?? I have Caly3 in CF , ZDP189 but I appreciate a lot VG10 for EDC use.I am quite reluctant in using the laminated blade because it scraches so easy.I was not able to get my hands on a Caly3 in VG10 because was discontinued before I could purchase it.I love Stretch a lot too but is quite big for urban EDC so I would love to have a Caly3 in VG10 not to mention Caly Jr. I became obssesed about Caly models I don’t have in my collection.I know it is a stupid question and no one knows the plans of Spyder crew but maybe you have heard some insight informations you can disclose to a fellow spydercillector. Hello and thank you for the kind words. To be honest, I haven’t heard or read any rumor about a re-introduction of the Caly 3 in VG-10. The closest match to a ‘scratch resistant’ Caly, is any of the higher grade UKPK models. The carbon fiber and titanium models come in S30V which has never scratched in my use. The knife is pretty much identical tot the Caly 3, except for the lack of a locking system and the handle material. And in regular EDC (urban) uses, I have yet to miss a lock on my knife.